Do your window treatments function the way you want them to in terms of offering protection from harmful UV rays, helping with light and privacy control, giving you energy efficiency, or enhancing your décor? If you’re not pleased with the way your treatments are functioning, you might need to consider getting something that will. At Treasure Coast Window Fashions serving West Palm Beach, we’ll be happy to help you in your search. We can ensure that you get the treatment that meets your needs and budget. Call today. We’re proud to offer the full line of Hunter Douglas window treatments, which include innovations and options that can meet any need. From privacy control to enhanced safety and security, you can find an array of great products suitable for any home. UV protection. Hunter Douglas window fashions are filter out at least 75 percent of the sun’s harmful rays—and many of the products, when fully closed, filter as much as 99 percent. Energy efficiency. Window treatments provide energy efficiency at the window by adding a layer of protection from the external elements and your home. 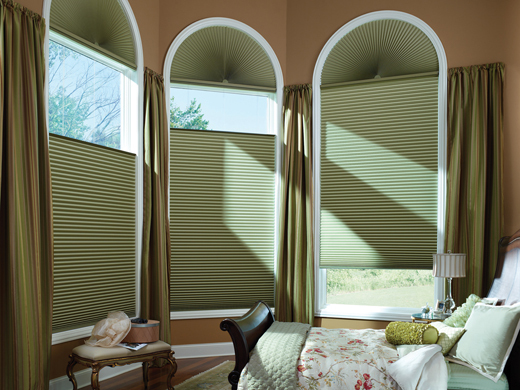 Plus, treatments like honeycomb shades are highly energy efficient and help cut down on utility bills. Privacy. Hunter Douglas, the leader in window fashions, takes security very seriously. They offer fabrics and materials in each of their product lines that will provide you with the level of privacy you want. Technology. Technological advances add a level of convenience and security that brings value to your home. Hunter Douglas leads the way in technology, with their PowerView® Motorization system. Privacy, security, and energy management are only a few of the added benefits that come with Hunter Douglas PowerView®. Style. In all of its product lines, Hunter Douglas offers a wide array of fabrics and accessories to choose from. You’ll be able to find just the right touch to match your décor, and even things that will adapt as your style changes in the future.